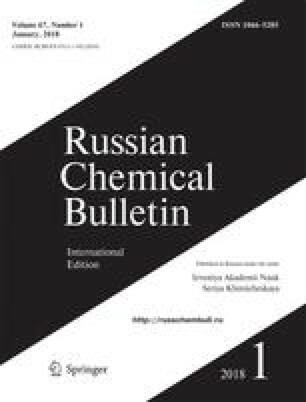 The properties of phenoxyl radicals generated by the oxidation of mono-, di-, and triphosphorus derivatives of 2,6-di(tert-butyl)-4-methylphenol (ionol) were studied by ESR. These compounds exist as conformers that are interconvertible with a temperature-dependent rate. Numerical processing of the ESR spectra gave the thermodynamic and activation parameters that characterize the interconversion of the conformers. The antioxidant activities of the compounds were studied in a model oxidation of oleic acid and with biological objects. These phenols efficiently inhibited radical oxidation reactions. Published in Russian in Izvestiya Akademii Nauk. Seriya Khimicheskaya, No. 4, pp. 744–750, April, 2007.